This morning when I went out to take my daughter to school it was -12. That is too cold for my blood and despite the beautiful snow on the ground there is NO way you're getting me outside to make a snowman. So, instead, I'll opt for the inside version made out of socks. They're easier to make, last longer and dare I say it... they're cuter too. 1- white sock. Use one that has a mid-calf or knee high tube on the top. Step 1: cut the foot part off of your sock and discard. You only need the tube part. This is great if you have socks that are worn or have holes in them. Step 2 & 3: Turn the tube part of your sock inside out and wrap a rubber band around the bottom. Make sure it is wrapped tightly. Then turn it inside out again so the rubber band is on the inside. 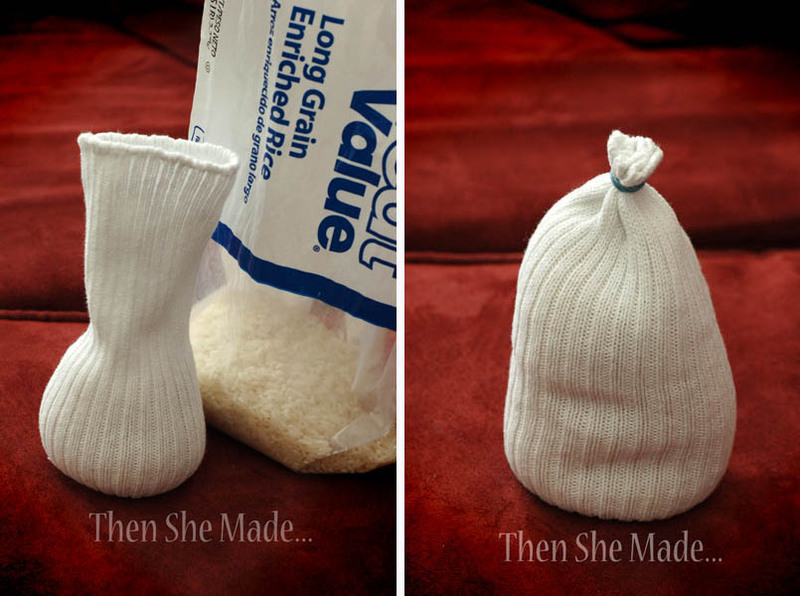 Step 4 & 5: Fill the sock with rice. Be sure to push the rice down as you go. 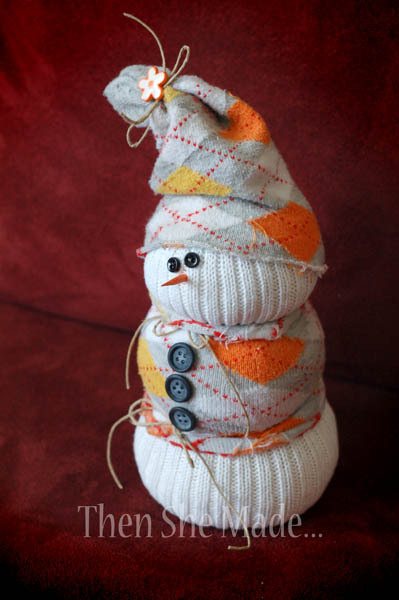 This will stretch the sock a bit and make it so you get a nice plump snowman in the end. Then, close the top by wrapping another rubber band around the top as shown in the photo above. Step 6: Taking the ankle socks, cut as shown above. The first one, you'll cut off the toe and the heel. The second sock you'll just cut off the heel. And, I should note. If you have a sock that doesn't have a mate and it's a longer than an ankle sock, you can dress your whole snowman with just one sock. Step 10: Next you add your embellishments. Eyes, nose, buttons etc... you can sew them on if you want but I went for fast and just used hot glue. 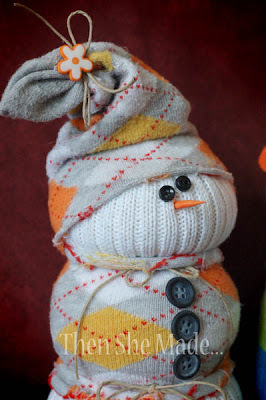 And there you have it - the cutest, easiest, little snowman you'll ever make. I whipped this little guy up in less than 10 minutes and I didn't even get cold in the process. Here is one of his friends: This guy was made the same way as the one above only I didn't add the twine at the bottom of the sweater. 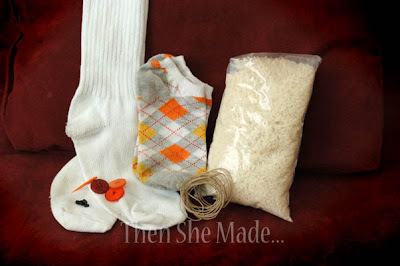 - you could sew the sock instead of using a rubber band. - you can add mushed up potpourri to the inside so it will smell good too. So that's it - super easy and way cute! Those are too cute! I may have to go digging through the sock drawers tomorrow! I might be the only one wondering, but where did you get the snowman's nose?? these are darling....I am usually a class room Mom and these would be an easy project for a holiday party. Totally bookmarking this for next year! And thinking maybe a Valentine's version could work for our upcoming 3rd grade party!! cute idea! I have seen other versions of this, but yours is way cuter!! Thanks for the tutorial, you really did a great job showing how it's done! Okay, so these are the cutest snowmen ever. And your tutorial is great. really cute! rice is a great idea! and love the addtion of the patterned socks! thanks so much! You have a wonderful blog... full of great crafty projects. These snowmen are adorable! I'm the Craft Editor for Reader's Digest Association (Milwaukee branch) and am interested in one of your previous craft posts for an upcoming publication of Country Woman magazine. I didn't know how else to contact you so I thought that I'd make a comment about it. If you are interested, please get in touch with me for more information. My email address is Shalana_Frisby@rd.com - I hope to hear from you soon. We would really like the opportunity to feature your craft and blog. Thanks for your time & happy crafting! 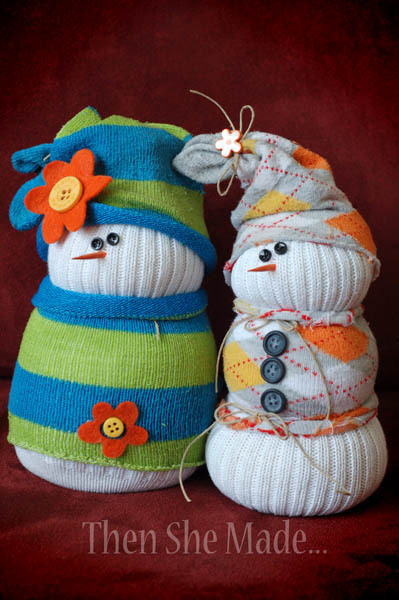 These are absolutely the cutest fabric snowmen I've seen all season! I love that with the rice they will be more stable than if they are filled with fluff! Cutest Snowman ever!! I've made sock snowman many times but mine never turned out like yours ;) Love them. Oh my... these are wonderful! Hands down, the best crafted snowmen I've seen. I'd love for you to come link these up at my party. Very creative idea, congratulations .. it's nice to see that a creative person can be of anything to do something, commendable .. Very creative idea...Thanks for your time..
Oh boy...I am SO making these!!! I just saw these on Pinterest and they are SO adorable! I can't wait to make some. What a wonderful idea. I just did this craft after finding it on pinterest and I LOVED it! So easy and SO cute!! Cute, cute, cute! I saw this on Moms By Heart. I think we must make some. Hi! I know in this moment your blog and is so cute. I love your chritsmas socks! Have a nice day! Now why didn't I think of this? This is so cute! Totally going to do this for Christmas. Thanks for such an awesome idea! I saw these on Pinterest and OH MY WORD, they are toooo stinking cute! I can't wait to make a little sock family. =) Thank you for sharing! Totally Love them....my son had a winter project last week wish i would have found it earlier but i'll still make them. SOooo cute! Just saw this on Pinterest and wanted to let you know I LOVE IT! My son and I just spent a day making these for his friends for Christmas presents. Went to the charity shop to get all the socks. They look fantastic. Thank you so much for sharing this idea they are just adorable and am sure his friends will love them. These seriously are so cute! I am totally going to make these this year. I have a question though...how big are the buttons you used for the eyes?? Super fun and easy craft! Love these! 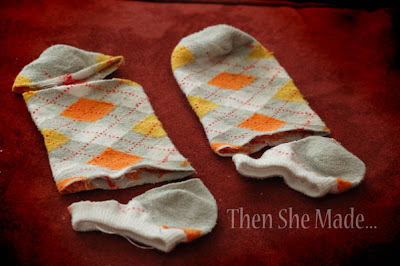 Just made them with a friend and a little tip we discovered is that you definitely need a mans tall/knee sock for these. 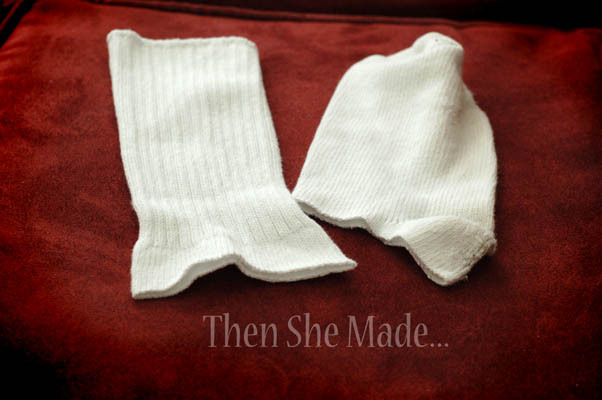 We bought womens crew socks and lets just say they are going to be the snowman kids lol! These are so CUTE! I collect snowpeople so really plan to make these - with my granddaughter... Tooooo Cute! Amy, I found this on Pinterest & fell in love! I posted it on my blog, giving you & your blog all the credits...of course! Hope you don't mind me sharing! I saw these snowmen on Pinterest and LOVE them. Made a couple for my mom and put the post over on my blog, of course giving you the credit for your creativity. check it out if you'd like! Thank you Thank you Thank you! Love this craft and am sitting here making them right now! Made the first one all the way through to see if mine would turn out even half as cute as yours (I have a talent for totally destroying any good idea!) It turned out fantastic, your instructions were perfect and so simple to follow with all the details and pictures. Just wonderful! Now making several more!!! Happy Crafting! I love these! They are so darling. I featured them on my blog: http://www.organizinghomelife.com/archives/1023 Thanks for sharing the idea. That is unbelievably cute! And I have no shortage of odd socks, I can assure you! OMGosh, these little guys are sooo very cute. I also just ran across ur site. ur tutorial is so great, easy to understand(which I like,ha) got my socks ready to be made up...what fun!!! thank u so much. am going to put one in each of my grandkids stocking's..MERRY CHRISTMAS..
Those are so cute! Such a creative idea. i absolutely love this!! i made 3 tonight and only had to spend about $10, i had a lot of things on hand. these will be perfect gifts for the grandparents!! thanks for the idea!! I am among the many that love your idea! I have not read all of the comments, so this may be a repeat...but, I am using men's tube socks, knee high, and cutting them in half. No waste! I also bought fuzzy footies that go above the ankle. I cut the heel part out and use the foot for the hat and the sock part for the snowman's sweater. Hardly any waste there, either! The fuzzy is a little messy, as it wants to shed some, but looks cool! Thank you for posting this idea! It is awesome! These are too cute! Thanks for sharing! Made one last night - it was so easy & turned out super cute! Thanks for sharing! I made these with my crew of three to five year olds, today. What a great project. Thanks for sharing it! 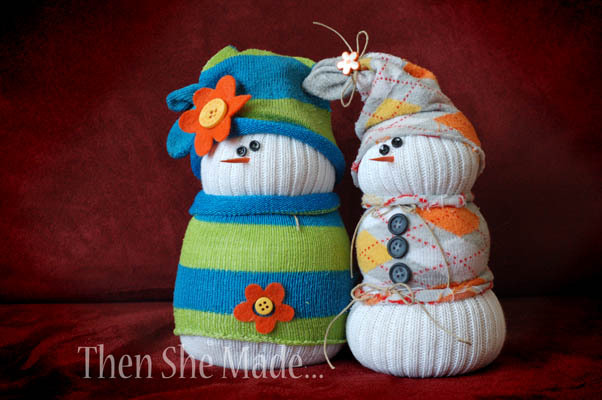 I made snowmen for Christmas for the ladies in family and they are so cute! They loved them, and I made one for myself, too. Thanks so much for the sharing! If these were any cuter, they'd be illegal!!! And thanks so much for sharing the how to! I love them!! I found your blog on Pinterest... I've just started mine some days ago and I'm quite new to crafts... I've begun scrapbooking two years ago, and since then I've started trying new crafts... blogs are a way for me to catch new ideas, since in Italy those kind of crafts are not so popular, and your blog is really great! OH MY GOD THESE ARE SO ADORABLE!! I'm unemployed and am trying to find gift ideas for my family for this year. I struggle with my sisters because their tastes are so different than mine when it comes to decorating. These are PERFECT! I can't wait to get started. Cheap, cheap, cheap, too! I have seen these before a long time ago and actually have made them... slightly different variation though. Yours are so cute! Hi found you thru Pinterest, these are cute! thanks for sharing your tutorial! I've been making sock snowmen with my classroom as parent gifts for years. For simplicity's sake, we just use one men's white tube sock for the entire thing (ours are minus sweaters), and are altered slightly from these. We use rice for the bottom, but a styrofoam ball for the head. We use the bottom 3/4 of the sock as the body and the top 1/4 for the hat. For the hat, we tie that portion of the sock off with ribbon about halfway down, and then cut slits in it all the way around down to the ribbon. It makes them look like the adorable "tag" hats kids wear now! We also use a toothpick cut in half, stuck into the styrofoam ball, for the nose. My son and I just made a few of these. I just love them. Thank you! Really cute ! Just to let you know I found your picture on facebook, with no link back. I found your blog cause your name was on the picture and googled it, and only because of that. Wonderful: they are so cute! These are so cute! I love that you can use old socks for them and that it really requires very little skill. Great tutorial! I can't wait to do these with my kids! We are going to work on them this weekend! I found these on Pinterest and had to try to make them. I didn't have everything you used so I substituted stuff. I used kids crew socks, Christmas socks, marbles, polyfil stuffing, rubber bands, felt stickers, markers. The first sock I used I messed up and ended up making smaller ones. If you send me your email I will send a pic of how ours turned out. I'm not sure how to post pic on here. Thank you so much for the idea, my boys and I had a great time crafting together. Little imagination goes a long way. Thanks again. Merry Christmas! These are SO ADORABLE!! I'm totally trying this. Thanks for sharing!! Just had an evening of crafting with some friends and made these adorable little guys. Everyone had a great time, and they all looked so cute! Thanks for the great idea! I found your link on Pinterest and fell in love with the little guys! I just made 9 of them to give away as gifts for Christmas. They came out to less than $5 each, so I am happy to have a cheap and adorable gift to give. Thank you! My friend found these cute little guys on Pinterest. We hosted Craft Night last night and this was our project! Thanks for the tutorial! All the ladies where super excited to make these. We gave you the credit of course! They are so cute and easy to make. Thanks for the tutorial. I did not want a christmastree this year, but I sure do make these snowman! Working on a dozen now! Half done but I can see how cute these will be! Thanks for your idea! I think this can be done with ankle length socks. As a chiropractor for family chiropractic, I can bound these sock balls with anklet support casts. It would be a great display for the holidays. My 9 year old granddaughter made these snowmen for everyone for Christmas and they are so cute. One suggestion for the nose: she used orange foam ear plugs the cone shaped ones. The best ones are made by 3M Soft Foam Ear Plugs, 28dB. Ebay sells them. They are tapered and look like a carrot. She hot glued them on. So cute. Your blog is great! I had lots of fun making these for Christmas and Birthday gifts! I posted a few pictures of the ones I made! Thanks! I have probably made over 200 of these sice November 2012. Gifts fo some soft some I made Christmas ones January ones valentine theme and st Patrick themed. I Hadley now adapted them into Easter bunnies. Such a fun and simple idea! I just made these yesterday with a friend. Thanks so much for the idea. I just blogged about it if you'd like to see our finished products :) (and of course included a link to your "how to" if anyone else wants a try). Wanted to let you know that this craft was highlighted on the at play blog yesterday. These little snowman are to die for. So adorable,can't wait to make with my granddaughter. Thank you so much. I absolutely LOVE THESE! My grandgirls and I will love making them. Last year, we made snowmen using baby mittens, a wooden ball head,and rice in the bottom to hold them up. These are a cute variation without the ball head. They have many unmatched socks-I'll have them bring them over and we'll have a ball. Thank You and God Bless! So very cute! I made 4 tonight out of a 5lb bag of rice... just wasn't satisfied until the were uber plump! Thanks for the great tutorial! I can't wait to get started making these cuties! I love and collect snowmen and so do many of my friends and family. I'm so inlove with this idea. Thanks for sharing it. Can you use pipe cleaners too? Tip of shish kabob stick..snip it off to length and paint orange. LOVE these! Just enough rules with way enough room for creative juices! Thank you so much! I discovered using a clean empty container from parmesan cheese works great for filling the sock. Fill it with rice. Shake it down and top it off so that your snowman will be nice and plump. Slide sock over the container opening and flip it back around. TaDaH! Full sock!! I was looking for a fun, cute and easy project for my Junior Girl Scout troop. Your snowmen were perfect! They LOVED this craft! My daughter is actually sleeping with hers. Thank you for the very thorough step-by-step instructions and clever idea. Love these... The dollar tree has cute patterned ankles socks 3 for a dollar! Incredibly frugal project!! Love these snowmen! I saw the link on Pinterest and we used your instructions to make these at this year's cookie exchange party. Everyone loved them and we ended up with 9 really cute and individual snowmen. There's a picture of all of them together on my Pinterest board - http://www.pinterest.com/jlhgabel/2013-cookie-exchange/. Thanks for the wonderful instructions and great idea! How much rice do you need per snowman? 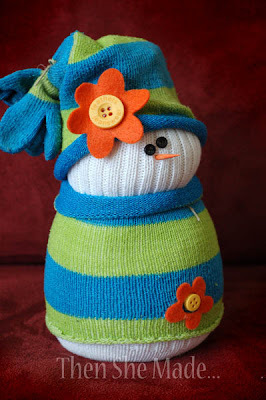 I am just finishing a post on my version of your absolutely, adorable snowmen. I found them via a link on hometalk that I just added your credit to. I will be linking your original DIY to my post and I hope that will bring you even more followers. I am now your newest! Happy Holidays....I hope that you will like mine, too! These are so cute, cheap and easy to make! I started by making a couple for myself and now friends are begging me to make some for them! I've also taught my step daughter to make them. Thank you for making me into the "crafty person" my friends think I am! Love these and can't wait to try them. My daughter is also sort of a SHEEP fanatic. I keep thinking someone with crafty skills could do something like this but to make cute sheep! Any ideas? An AMAZING Idea! I tried it today with my 5 year old daughter. She loved it and said it was a lot of fun to her. For the Nose we used some orange paper, rolled to a nose, glue it and let it dry. Perfect. Super-cute snowman. However, be aware...if you keep them long-term, the rice can develop bugs!